The post was sponsored by Disney and Monsters University but all opinions and photographs are my own. We have always been a huge fan of the Disney/Pixar film Monsters Inc. So when they came out with the sequel Monsters University, we couldn’t wait to see it! We saw it opening weekend and had a blast. My boys just love Mike and Sully! Now that Monsters University is out on Blu-ray, we decided to throw a little viewing party breakfast! 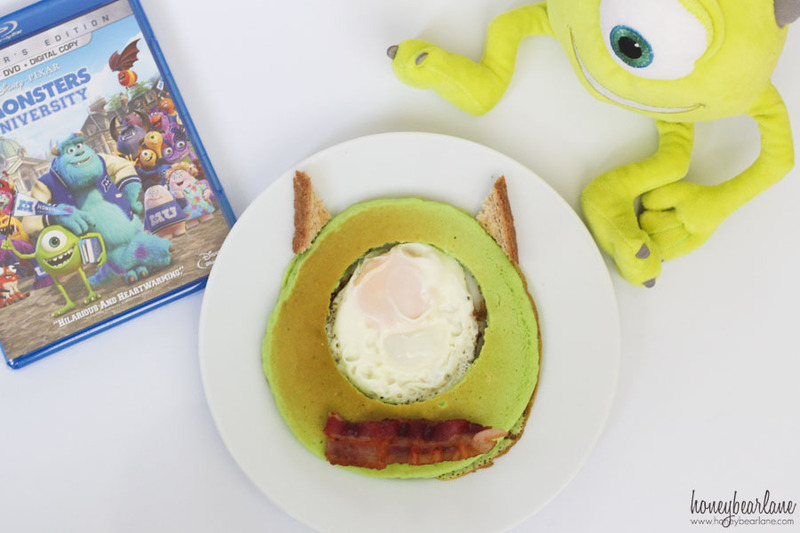 It’s pretty easy to make these festive Mike Wazowski pancakes. Especially if you use the cheater pancake mix like I do. He has a pancake body, a fried egg eye, a bacon smile, and toast horns! My kids were so excited about eating these for breakfast. Here’s how you can make them…it’s easy enough. Mix up your pancake batter. I use the Krusteaz mix because I like the taste better. Add some food coloring…green and yellow. This will give you more of the Mike Wazowski green rather than a shamrock green. Heat up your pancake griddle and spray it with non-stick cooking spray. 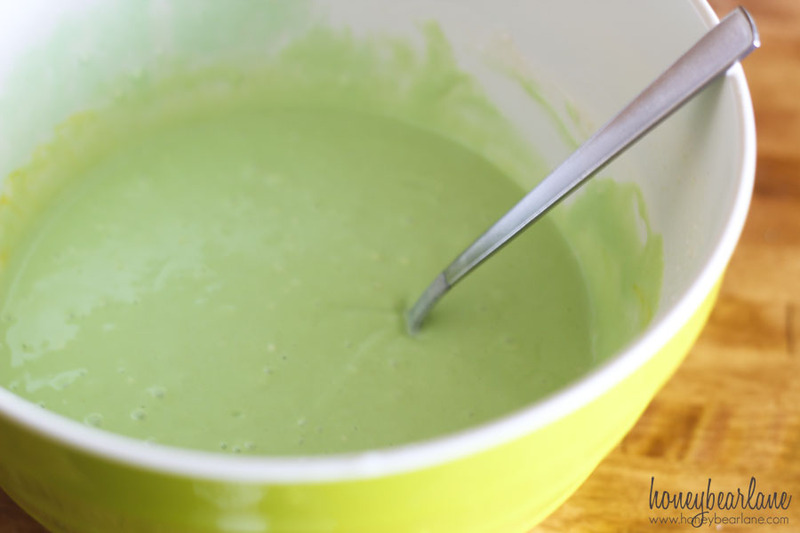 Using a measuring cup, pour a circle of batter on and let it bubble through. Don’t brown it very much or you won’t see the green as well. Flip it over and using a circle cookie cutter, cut a large circle out of the pancake and remove. 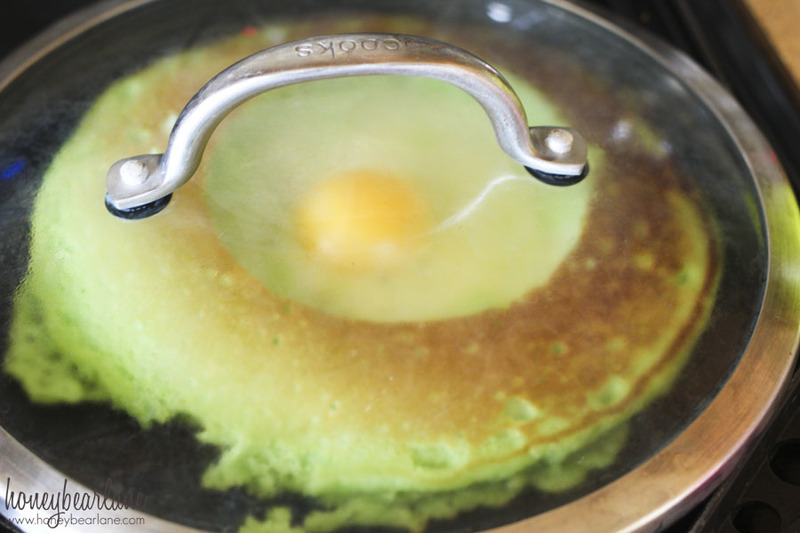 Then crack an egg into the circle hole and put a pot lid over it. This helps it cook faster. *Alternative method: This may work better for you…you can cook the pancake as normal and remove from the griddle. Cook the egg separately and use the cookie cutter to cut it to a perfect circle. Then cut the hole in the pancake and slide the egg into place. Fry up the bacon and cut the corners off a toasted piece of bread. Decorate your Mike pancake accordingly and serve! Monsters University will be available on Blu-ray October 29th: you can pre-order it here! Make sure to visit the Monsters University Facebook page, Twitter, and Pinterest! I am new to your blog! 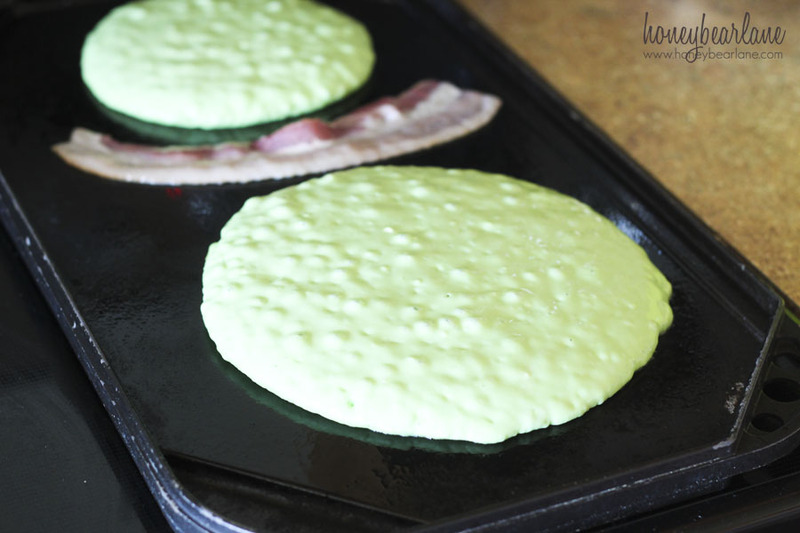 I seriously LOVE this pancake idea. My nieces and nephews would die if I made these at our next sleepover party! Thanks for the great idea. Thank you! My boys loved it and it was tasty too! These are so cute Heidi – how fun!